Jessica Neal walks through the doors of her old high school gym wearing a black “Fight Against Heroin” T-shirt. She tries to calm her nerves. Eight years is a long time to be away. “I get goosebumps being back in here,” she says. Jessica has lived a few lives since then. The teenager who played basketball on this same parquet floor for Washington High's Lady Prexies and wanted to make her parents proud is gone. Her classmates would not believe what she’s been up to since graduation, unless they happened to read about it in the newspaper last August, or hear about it on Facebook. “How many people remember the young lady who overdosed in Walgreens last year?” M.J. Markley, the organizer of this May event, asks the 40 or so people in the audience. “Remember seeing that story in the news, in the paper? And, you know, thinking, who is this girl? Jessica is 27 years old. She is the mother of 3-year-old Julianna, who follows her around and has now licked all of the pink icing off her doughnut. Julianna has been through a lot, but she seems happy. She tends to worry when she loses sight of her mother. 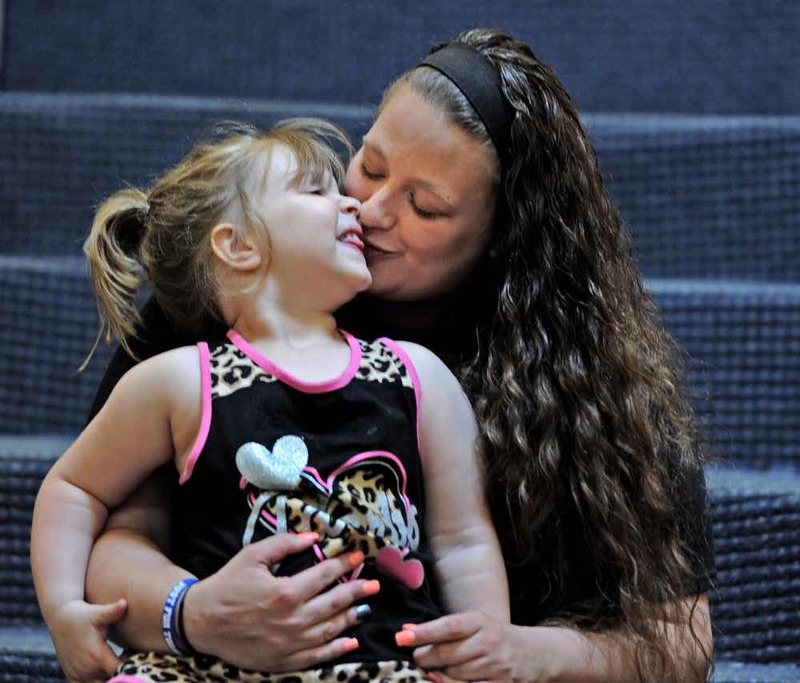 Julianna was there, sitting in her stroller, when Jessica collapsed on the floor of a Walgreens bathroom stall because she injected too much of a lethal batch of heroin. All around Washington County, you can still feel the reverberations from August 2015, when nearly 40 people overdosed in the span of a week from heroin laced with the almighty opioid fentanyl, when first responders armed with a nasal spray antidote called Narcan held families’ futures throughout the Mon Valley in their hands. In seven days, six would die -- three from the fentanyl batch and three from unrelated opioid overdoses. Those who survived were the lucky ones. Using 911 dispatch records, the Post-Gazette identified four of the approximately 30 survivors. 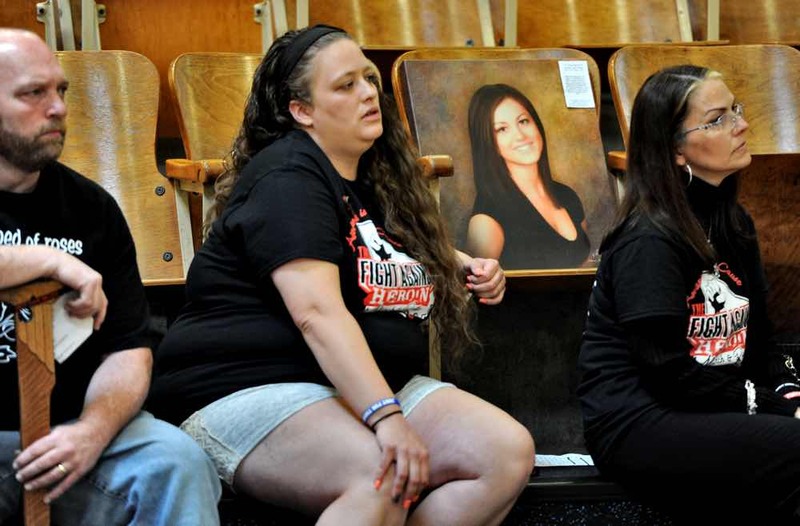 The overdoses of Jessica Neal, Melanie, Brenda and David were set apart by 36 hours stretching from the night of Aug. 16, 2015, to the morning of Aug. 18. For all practical purposes, each of them died, and strangers with syringes arrived to bring them back. Melanie, 20, handed the end of her teenage years to heroin and became a criminal. Brenda, 50, felt alone in this world after a great loss and used drugs to escape it. David, 43, yearned for the love of his wife and children but also couldn’t say no to the needy pangs in his stomach. Melanie, Brenda and David requested that their last names not be used, out of fear that an addict’s stigma would follow them forever. They had been given a second chance at life, but what were they going to do with it? All four survivors followed during the past year by the Post-Gazette shared two things very much in common: They say they were led to heroin through the use of painkillers prescribed by doctors, and they never imagined they would stick a needle into their arm. Because of her public embarrassment, Jessica Neal doesn’t have the option of protecting her identity. She now lives with the shame that any mother would feel. It has taken her nearly nine months, but she is ready to open the wound, potential judgment be damned. Jessica takes the microphone. The lone person stirring in the old gymnasium is blonde and blue-eyed Julianna, who is being corralled by her great grandma. Six months to the day of her brother’s death, Valerie Mack picks up the phone and hears the news she’s been waiting on. Valerie hadn't heard much from the police since Aug. 16, 2015, when they took the leftover heroin from Sammy Mack’s Washington bedroom. Sammy, 50, had only started using a few months prior, after he had gotten addicted to prescription painkillers while recovering from a motorcycle accident, Valerie says. She felt he was coming out of his funk — he had just gotten a new painting job — but then he crossed paths with the heroin labeled “Made in Colombia.” Sammy came home, went upstairs, locked the door and never awoke. “Are they going to try him for murder?” Valerie asks the caller. Down at the courthouse, U.S. Attorney David Hickton and Washington County District Attorney Gene Vittone are announcing an indictment against Ronald McMillian for his role in the distribution of the deadly heroin that shook awake this sleepy rural county that stretches southwest of Pittsburgh to the West Virginia border. He was not charged with murder. Even in February, the dark cloud of August casts a long shadow. Vittone vividly remembers that Sunday afternoon he spent out campaigning at the Washington County Fair. Unbeknownst to him, as he mingled with voters in the summer sun, hundreds of stamp bags of heroin laced with fentanyl — an opioid 100 times more powerful than morphine — were seductively snaking their way through the county’s green hills. Vittone was about to be put to the test. Two months before, in June 2015, he had made the controversial decision to approve the use of Narcan by first responders. 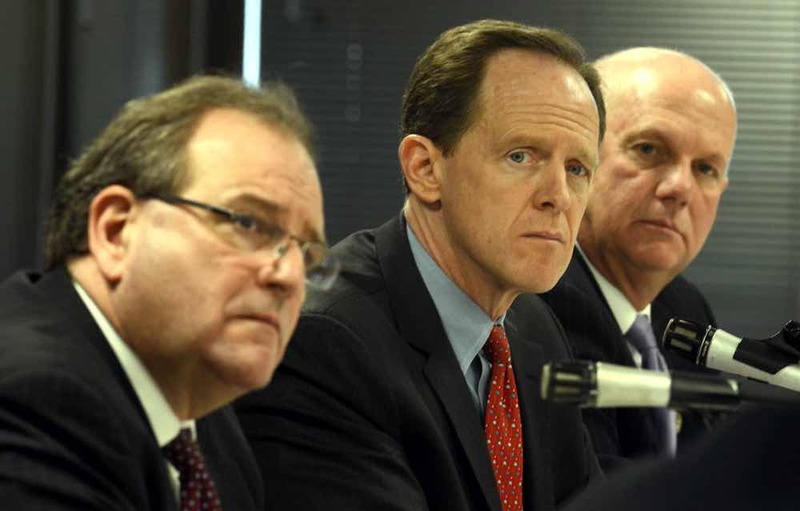 The less empathetic and more Darwinian of his constituents railed against the use of Narcan, saying that he was allowing cops to play God and to slow the methodical drum of natural selection. But Vittone, who worked for many years as an emergency medical technician before he entered the practice of law, had chosen to gamble on the good inherent in all of us, that a person’s life was always worth saving no matter how desperate it had become. In the months since Vittone’s decision, Washington County had introduced a new statistic into the ledger: The save. The ones who didn’t wake up after using the fentanyl-laced heroin were often those new to the drug, who hadn’t built a tolerance. On this day in February, with the cameras turned on to trumpet this first indictment related to the August overdoses, Vittone would declare proudly that 36 saves had been made by the use of Narcan, compared to 33 fatalities since August. No, not everybody could be saved. And, as tragedy would have it, the ones who didn’t wake up after using the fentanyl-laced heroin were often those new to the drug, who hadn’t built a tolerance. Sammy Mack was, and so were the other two who died that week, 35-year-old Tony Terrant and 21-year-old Brooks Watkins. When the autopsy came in on Brooks, he showed just one other faint mark on his arm, which likely meant that the young man was no addict. Not yet, anyway. When notified of McMillian’s indictment, Brooks’ parents, John and Amy Watkins, take little consolation. It doesn’t help to lessen the hurt in the house on the hill in Monongahela, where a boy once dreamed of being a baseball star and a mother can’t bring herself to enter the quiet bedroom where he left her. The first responders at the car wash in Washington weren’t surprised to see the two men laying lifeless in a Lexus, one with a second bag of heroin already loaded up and a needle in his arm. “It seemed to me that, after it became news that everyone knew we were giving Narcan, they would be going to a public place, where if they OD’d, someone would be coming to help,” said Alan, a first responder who arrived on the scene around 1 p.m. on Aug. 17. They had learned to apply the Narcan by putting the syringe up a dummy’s nostril, but now David and his friend were depending on them. David had just gotten out of rehab. He was hoping to win his family back. That morning, he recalled later, marked 28 days clean, and, when he went to get the heroin they were calling “fire,” he was only planning to make some fast cash by selling it to clear up some debts. But then David figured, hey, why not? He could go to his Narcotics Anonymous meeting high and no one would notice. As it turned out, Alan would not have to make his first Narcan save. Paramedics quickly came and sprayed the antidote. David’s was the first save Alan had witnessed, the first of many he’d see in the coming year. David fidgets. He checks his phone often. He doesn’t have a job, but that doesn’t mean he isn't busy. It’s late afternoon, and he’ll need another fix to get him through the day and protect him from the horror of heroin withdrawal. David considers himself a maintenance user. He needs about 10 bags per day to function. That will run him near $100. So, he hustles. He drives other addicts around. He’s always on call. He wishes he didn’t crave it. He wishes being a husband and a father was enough. Of course, David did overdose. Yet, the shock didn’t send him back to rehab. He has taken time out of his schedule to provide some context, to show that he isn’t just some junkie. David’s whole life, he has been enticed by adrenaline. In high school, he was an expert mogul and aerial skier with the dream of going to the Olympics. But he partied too much on the weekends and had so many absences from high school that he didn’t graduate. College probably wasn’t for him anyway. He became an alcoholic, but stopped drinking cold turkey a decade ago. He became addicted to cocaine, but licked that five years ago. He felt strong again. Four years ago, at age 39, he says an emergency room doctor prescribed him 160 Vicodin 750 milligram pills without asking if he had a history of addiction. Once the pills ran out, David needed something for his pain, and heroin was much cheaper. As he tells his story at the Washington Starbucks, his friend, Frank, sits by his side. If David ever needs a reminder of the craziness of life on heroin, all he has to do is look at Frank, who recently lost an eye to addiction and whose face is covered in red scars. Frank overdosed, fell and hit his head, bled, and was then attacked by a friend’s Rottweiler. For Frank, it started six years ago when he was prescribed painkillers after a dirt bike accident. Frank was a welder, and David was a contractor. It didn’t have to be like this. David’s phone rings. He thanks you for your time, but he has to go. The contents of the creamy brown heroin were no mystery to Melanie. She knew that the “Made in Colombia” stamp bags she and her boyfriend bought had been cut with fentanyl, and, to her, that only made it more desirable. Melanie understood how dealers thought because she was one. The chaos of August simply came down to some cruel math: Fentanyl is cheaper than heroin, yet immensely more powerful. So addicts would pay more for a product that costs less to make. With this stuff, she only used half a bag. She still overdosed. To the heartless supplier, it didn’t matter that fentanyl was deadly and could kill a loyal customer. “They were so strong, and when you tell other addicts how strong they are, they want it automatically,” Melanie would say. Usually, Melanie would use five to 10 bags at a time. With this stuff, she only used half a bag. Her boyfriend took her to the bathroom, laid her on the floor and threw water on her face. Before the paramedics arrived, Melanie came back. She told them that she didn’t need to go to the hospital. They told her the police would be on their way. Melanie wasn’t going to hang around for that. There were warrants out for her arrest because she had been caught with drug paraphernalia. She ran into the woods behind her mother’s trailer and hid until it was safe. Melanie adjusts the mirror of the blue SUV and moves the driver’s seat forward. She hits the gas a little too hard and giggles. “Lead foot!” her godmother, Lynette, jokes. Will today finally be the day Melanie, now 20, gets her drivers license? She has already passed the written part. Now she pulls into the front of the line for her driving test and waits. The instructor approaches. He sees a small, blue-eyed girl with her hair and makeup all done up for her picture. She wears strategically ripped jeans and hot pink nail polish. Looking at Melanie, there is no way anybody could imagine the depths of hell that she used to call home. At 17, Melanie attended vocational-technical school and worked at a fast food joint. She had played soccer in high school, but had to stop because of her knee. She went to see an orthopedic doctor, who recommended surgery to repair a genetic condition. He prescribed her Percocet. For nearly a year, she said, all she had to do was ask, and he’d leave a prescription with his nurses. She didn’t even have to see him. The day Melanie turned 18, she moved in with her boyfriend, who introduced her to heroin. “Just once is all it takes,” she says. “And actually, when I started doing heroin, I hated it. I’d puke, my stomach would hurt, but I’d keep doing it. I don’t know why. Melanie lived in Washington County’s alternate universe where the only thing that mattered was the next fix. For a while, she and her boyfriend worked doing construction for a man who built his business model around employing addicts and paying them exclusively in drugs. They would get in on the action, too, selling enough heroin so that they could always be high and still have money left over to stay in cheap motel rooms, buy cigarettes and pay for the rental car. The overdose didn’t exactly scare her straight. Her mother and sister turned her in to police, and she spent a month in jail, which was the best thing that could have happened. She had no choice but to fight through 10 days of intense withdrawal. When she came out of it, she realized she actually had a chance to beat her addiction and return to the mainstream. Melanie hasn’t used since August. She’s gotten a job. She’s getting her GED. She’s a part of her family again. She’s … Melanie. “When I got out of jail, what I wanted the most was a chocolate milk shake,” says Melanie, who has added 30 pounds of healthy weight. Melanie has learned to appreciate boredom — and to exist with pain. Her other knee is acting up, but she can’t take that risk of surgery. The driver’s license is an important step. Her mother has promised to get her a car, because Melanie earned back her trust. Now, the instructor has taken his seat. Melanie drives to the back parking lot, where her first challenge is to parallel park. The only problem is she had not attempted the maneuver from this angle, with the driver reversing toward the passenger side. She inches the car back, turns into the spot but cuts it directly into a cone. She flunks. “Well, I’ve got to reschedule now,” she says, getting out of the car. She feigns a laugh. “It’s the first time, babe. It happens,” Lynette says. “I didn’t practice going that way,” Melanie says. Jessica had never overdosed. In the addict community, that was a source of great pride. The night of Aug. 16, she saw her brother’s girlfriend overdose from the “Made in Colombia” stamp bag that was making its way through town. Still, Jessica wanted some. She felt immune. The next day, with $10 to her name, she bought two bags. “Be careful,” the woman who sold it to her said. Jessica took her 2-year-old daughter, Julianna, with her to a bathroom stall at Walgreens and began to shoot up. Jessica went blank until she was being picked up off the floor by a first responder who had revived her with Narcan. In the ambulance, Jessica was told that Child and Youth Services was on the way. But, Jessica said, she would later find out that a friend of Julianna’s father had heard the toddler crying in the bathroom and opened the stall door. She had recognized Julianna and called the man, who arrived at Walgreens shortly before CYS. A stroke of luck had kept Julianna with her family, but Jessica would still be charged with child endangerment. The next day, Jessica returned home from the hospital. A friend stopped by with unwelcome news. You can find Jessica Neal sitting in the front pew of Judge John DiSalle’s courtroom, drinking a Pepsi as she waits for her name to be called. Every few weeks here at treatment court, Jessica updates the judge on her progress. Listening to others’ struggles to stay clean can serve as inspiration for her to rise above temptation. The first man to speak has had a relapse. The next man up failed a screen for alcohol and is claiming he used too much VapoRub. Then, a woman in cuffs and an orange jumpsuit has been caught trying to falsify a drug test because she used heroin. Jessica tells DiSalle that she remains clean, having not used since Aug. 17, 2015. Jessica sees her daughter often and is hoping to move soon into a three-quarter way house where Julianna can live with her. She goes to a daily Narcotics Anonymous meeting, has a sponsor and has established a relationship with her higher power. DiSalle is pleased. The system has worked for Jessica. In jail, she spent 10 days in medical lockdown due to an abscess. If Jessica wanted CYS to back off and let her be a mother to Julianna again, she would have to prove that she wanted recovery. The county’s chief adult probation officer, John Moschetta, recommended her for treatment court, which is reserved for those with serious addiction issues. “I’m thinking, ‘This is going to save my life. I can’t do this anymore,’ ” Jessica says. Through her soul searching, Jessica has realized that she had been using — first opioids prescribed by doctors and later heroin — to fill an emotional void and numb the sadness that befell her when her mother became sick with Lou Gehrig’s disease. “You use this substance, you feel like you matter,” Jessica says. “It took all my worries away. You don’t care about your family. You don't care about your kids. You don’t care about anything. Your job. Your car. I’ve lost three cars due to my engine blowing up because I didn’t change the oil. I was renting my vehicle out to drug dealers. You don’t care. I’m not sick for the day. That’s all that matters. Judge DiSalle hears more sad stories than happy ones, and he likes the direction that Jessica is heading. “Keep up the good work,” he says. On the night of Aug. 16, eight overdose calls came into dispatch in the span of 70 minutes. Donnie, a concerned citizen, listened to his police scanner at his Washington home, as he often did to stay informed. “I don’t know what’s wrong with this town,” he thought. Donnie mostly worried for his 50-year-old wife, Brenda. She had been clean for more than a month and had just driven to the corner store to buy cigarettes. What state would she be in when she returned? At the 7-Eleven, Brenda ran into a familiar face that triggered a familiar feeling. In July, she had gone to rehab and received a Vivitrol shot to help prevent a relapse, but she had moved back her August appointment for the monthly shot (which works like Suboxone) to go on vacation. Her chemical defenses weakened, she was now confronted with a demon disguised as an old friend offering her two bags for 10 bucks. “Being clean so long, I thought, ‘It’s going to be a good high,’ ” she said. Now Donnie stood on their front porch, watching as his wife drove her Jeep past their driveway and hit a neighbor’s parked car. His fears were confirmed. He dialed 911, and soon an ambulance arrived. Brenda’s eyes were rolling back in her head. The paramedics gave her Narcan. She came to before the trip to the hospital. The next morning, when she awoke at home, she felt numb. It was not a good high. Brenda and Donnie keep their house dark. She doesn’t get out much during the long winter, partly because she doesn’t like the cold, and partly because she can’t move very easily with her back problems. With Donnie working a 9-to-5 she lives each day here with no company but her physical and emotional pain. In mid-March of this year, all she can do is cry as she talks about the events that brought her to the brink of death. This is how it had been since 2011. When her sister died of kidney cancer, she felt she had nothing to live for, despite having two children and five grandchildren. Then her best friend passed away from lupus, and her niece died from a heroin overdose. “God started plucking all these people out of my life,” she says. In the vast void, Brenda latched onto the sweet sensation she got when she would drink down the painkillers prescribed to her by doctors. The high would wash over her, and, inside the opioid’s protective cocoon, she could forget. Before long, Brenda was selling her pills — which can go for about a dollar per milligram on the street — to fund a heroin addiction she masterfully hid from her husband. Her two sons suspected what was going on with their mother, but the overdose broke down her wall of secrecy. The only way, of course, is to get clean and to stay clean. In November, she hadn’t used since the overdose, but she went to the hospital complaining of a toothache. Donnie says the hospital doctor prescribed her 10 Vicodin and a prescription signed by her neurosurgeon gave her 40 more. She says nobody asked if she had a history of addiction. “They’re basically like legal drug dealers,” Brenda says. On this day, Brenda says she hasn’t used in 39 days. She hasn’t been going to NA meetings. The weather, you know. Until it warms up, she will stay inside and continue counting the days, with each one a bigger victory than the one before it. It was a classic summer Saturday. John and Amy Watkins watched their youngest son, Jake, play soccer for Charleroi High in the morning. Their oldest son, Brooks, said he would join them in the afternoon to go to his aunt’s house. When they returned home from the soccer game, Amy yelled up to Brooks. No answer. She didn’t think anything of it — they were always trying to give their 21-year-old his space — and took the dog outside. Soon, Amy would hear Brooks’ phone ringing continuously. Jake told her that he was probably sleeping. She yelled again that it was time for him to start getting ready. No answer. Amy walked up the stairs and peeked in his bedroom. She didn’t see him. She checked the bathroom. Nothing. This time, she entered the bedroom and circled the bed. She screamed for John. He ran up to the room where he had installed baseball- and football-themed wallpaper and put up the sign that said “Watkins Field,” the room where Brooks would stargaze from his telescope and imagine the big world outside of Monongahela. Brooks was going to go see it — he had just decided to join the Navy. Now he laid on the floor, his lips blue. He was cold. John tried to breathe warmth back into him. “Having to give your son CPR when you know it’s not going to work… it’s haunting,” John would say. When the paramedics arrived, it was too late. Brooks Watkins was dead, and the scariest thing was, his parents never even knew he had a problem. John and Amy Watkins need there to be a heaven. Just the other day in church, the sermon made Amy feel like they’re going to see Brooks again. They do a lot of thinking, mostly in the past. You know that Harry Chapin song, “Cat’s In the Cradle”? The lyrics stick with John. At a Pirates game last fall, John caught himself having a conversation with the empty seat next to him. They don’t know what Brooks’ struggle was. They’ve spent the past year desperately trying to figure it out, to understand where they failed so that they can move on and give Jake the best of what they have left. There have been few satisfactory answers. Was it pills? 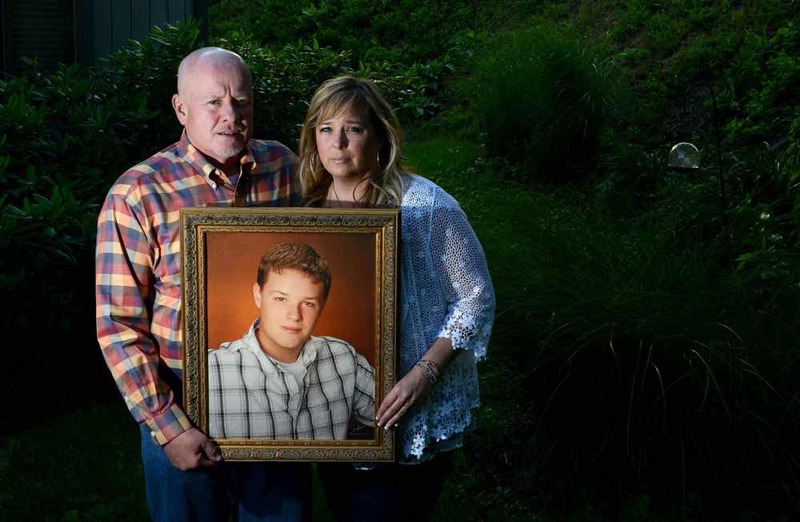 Brooks, a star catcher on the Charleroi baseball team, had a high tolerance for pain. They remember him having surgery to repair a torn labrum his senior year, and, while he took some painkillers, they recall Brooks saying he didn’t want anymore after just a day. At 19, he had his wisdom teeth out. Amy took a video of him in a loopy state from the morphine saying he had taken something that made him feel “real good,” which made his mom laugh. But they have no evidence that Brooks ever abused pills. So, they play detective, putting every little thing under the microscope. The few months before Aug. 22, 2015, he was mostly himself. He interacted with the whole family on their annual trip to the Outer Banks, N.C. He wore shorts and sandals and T-shirts, so he wasn’t hiding any needle marks. He hadn’t lost any noticeable weight. He was playing for a competitive softball team with friends. Still, looking back, they realize he had begun to tell them small lies. He would ask Amy for money more often. She wondered if he had an online gambling problem. The one time she pressed him on the issue of drugs, he responded that he wasn’t using anything and she could drug test him. She chose to trust him. On the morning he died, Brooks called his mother’s cell phone around 11:45 a.m. She was at Jake’s soccer game, and she had mistakenly left her phone in the car. That missed call will be ringing in her heart forever. Brooks’ parents and grandparents all went to college, but they simply didn’t gain enough education during the last decade about opioids and heroin. John’s father, John Sr., was the president of California (Pa.) University. He and Brooks started their own club, reading the same books and trading notes. John and Amy don’t believe their son was an addict, but they can’t deny that he may have been headed down that path. Someone actually had the nerve to tell them that they had been spared the pain of watching your loved one spiral away. “We would have done anything to save him,” John says. “I think he could have overcome this,” Amy says. They don’t take any chances with Jake, who just graduated high school. They drug test him. This summer, they decided to go on a family vacation. But it wouldn’t be the Outer Banks, where they’d been so many times with Brooks. They opted for the beaches of Sand Bridge, Va., where John Watkins would ask the extended family to honor Brooks’ memory one last time. Each person walked to the edge of the Atlantic, said something to Brooks and dropped a flower into the surf. These four who lived don’t have anything promised to them. In the middle of another hot summer, David is still out there hustling and hoping someday he will have enough of a reason to slow down. Brenda’s husband, Donnie, recently found his wife passed out in the morning with heroin lying next to the bed. She had been clean for 120 days. This ongoing dance between temptation and desperation is the daily reality today for Washington County — and for the many other rural counties of Appalachia. Despite the consistent effort by Washington County district attorney Gene Vittone and the county’s public safety team, there is no end in sight. In February, there was another outbreak of fentanyl-laced heroin, and, while Vittone felt they were much more prepared the second time, they could not prevent the deadly toxin from hitting the street. As of July 19, county 911 dispatch records show that there have been more than 340 overdoses reported since Aug. 1, 2015, resulting in 63 fatalities and 65 saves. Melanie and Jessica needed incarceration to get clean. For them, nearly a year later, recovery is fragile but ongoing. Melanie would pass her driver’s test. She had practiced parallel parking from each angle every day for two weeks. She has regained control, her hands sitting on the spinning wheel of her life with a death grip on ten and two. Her sister passed down a car to her. Melanie works three jobs. She has a boyfriend who does not do drugs. It’s like she’s on fast forward and won't take her finger off the button until she's caught up. Melanie and Jessica have the same fear: That someday they will have no choice but to go back to the hospital and find themselves at the mercy of a doctor’s prescription pad. Jessica now realizes the power her story can have on others. She is back at her alma mater after eight years, with a microphone and the small crowd listening to her, ready to fight against an epidemic that has taken over the country. Through her 15-minute speech, Jessica keeps her emotions in check. She appears confident in who she is and who she wants to be. There is clairvoyance in her words as she makes her finishing point.